Open YouTube, it gives us a sense that we are swimming in a lake of music videos, Taylor Swift, Justin Bieber, movie original songs... But if you only wanna the MP3 audio, how to rip MP3 from YouTube video? To transfer YouTube to MP3 for playback on MP3 music player, iPod, or make ringtone for iPhone, you have plenty of ways to go: YouTube MP3 ripper, online service, web browser Firefox Chrome extensions, Android iOS apps, they all can rip YouTube video to MP3. Follow the methods below to extract MP3 audio songs from YouTube in high quality, 320kbps, 256kbps, 192kps, 128kbps, etc. all at your choice. It is a highly recommended solution with no ads, virus or plugins and get the highest audio quality with a MP3 YouTube ripper. MacX Video Converter Pro is an all-in-one program that enables you to extract MP3 from YouTube with untouched high audio quality in a single click. With the aid of Hyper Threading Technology, it lets you rip MP3 from YouTube HD or SD video with 16× faster speed, it only takes a few seconds to rip Bollywood Hindi songs hit singles from YouTube in MP3 for Android iPhone iOS devices. You are free to adjust ripped YouTube MP3 audio bit rate, 128kbps, 256kbps, 192kps, and many more choices. And it is very easy to use, follow the guide below to rip MP3 music from YouTube video for Android, iPhone 7/6s/6 Plus, iPod, up to iOS 10 devices with the highest audio quality. Download YouTube music videos, songs, movies, TV shows, 4K, etc from YouTube, Facebook, Vimeo, VEVO, and 300+ online sites. Work as a YouTube audio converter to download YouTube videos to MP3, AAC, AC3, WAV and convert YouTube to MP4, MOV, WMV, MKV, etc at fast speed. Transfer YouTube videos to iPhone 7, iPad Pro, Samsung Galaxy S7, Chromecast, Apple TV, PS4, etc with 400+ device profiles built in. Built in 370+ video and audio codecs, support converting among HD and SD videos, e.g. MKV to MP4, WMV to MOV, MTS to MOV, FLV to AVI, etc. Make full use of CPU cores, up to 8, and take advantages of Intel QSV for fast ripping MP3 from YouTube. Step 1: Free download high quality YouTube MP3 ripper for Mac, windows version for Windows PC, and run it, if you wanna download YouTube video to MP3, click "YouTube" icon, copy and paste video URL to the box frame and click "Download Now" button, select "Auto add to convert", you will be directed to the conversion page. Step 2: Choose output format. To rip MP3 from YouTube video, go to "to Music", and select "MP3" as output music audio format. You can also convert YouTube to AAC, AC3, iPhone ringtone format, OGG, WAV(lossless) and more. Step 3: Click "Browse" button to select a folder to save ripped YouTube MP3 audio songs. Step 4: Click "RUN" button to start ripping YouTube video to MP3 audio with high quality. In fact, the program is able to download videos from 300＋ sites, and convert video to over 180 video formats and 14 audio formats. It is a free online service that allows users to rip and extract MP3 audio from YouTube for free directly online. It is simple to use. Copy YouTube video URL, choose conversion format, click "Start" and then "Download" button, and the YouTube to MP3 ripping is done. No register required, no need to install software. Users can choose different YouTube video quality(1080p, 720p, 480p), and file size. 256kbps is the best audio bit rate setting. Supported video audio formats: MP3, 3GP, AVI, MOV, MP3, M4A, AAC. Rip MP3 from YouTube is pretty easy and straightforward. File size is limited within 100MB maximally. 25 conversion minutes per day and 25 minutes maximum conversion time per file. It takes a bit long time to download a YouTube file, especially when it comes to YouTube conversion, see, to MP3. When you rip songs from YouTube in MP3 for free online, you will probably get malware, virus, gsave plugins and extra unknown files in return. Video2MP3 is a free convenient YouTube MP3 audio ripper extension for Chrome, Firefox, Safari. Open YouTube video, you can use the addon to convert YouTube to MP3 in high quality without further steps to copy paste video URL. The most appealing feature is its ease of use. 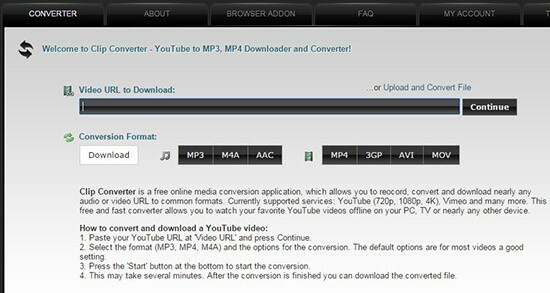 You can free download the YouTube MP3 audio extractor via its official site for Chrome, Firefox, Opera or Safari. Convert any video to MP3. During the YouTube to MP3 ripping process, your web browser may crash. Only premium members have access to no advertising. No access to adjust audio quality and settings. You don't have many choices when it comes to apps for YouTube to MP3 ripping on Android. Tubemate is a free app for Android user to extract MP3 from YouTube 1080p 720p videos with high quality. You can download YouTube Hindi songs free, hit singles, movie game soundtracks on Android and share them via social networks. It is hard for such free illegal YouTube MP3 ripper app to get a place on Google app store, but users can download from its official sites and verified software sites. You can browse YouTube videos directly with this app. You can download the videos in 240p, 720p and higher . The free YouTube MP3 audio ripper is supported ads. You can't get rid of popping ups when ripping songs from YouTube in MP3. When ripping MP3 from YouTube video, the app requires alarming permissions, like ability to read, change or even delete files from Android phones SD card, disconnect internet, precise GPS locations, etc. This a free app to rip MP3 songs off YouTube on jailbreak iOS 6, 7,8 iPhone. Yes, it doesn't work with iOS 9 iPhone, iPad and iPod yet. The app for iOS devices has direct search bar, which is quite convenient to find the song you wanna rip. You are allowed to rip MP3 from YouTube video in MP4, AVI, MOV, FLV, 3GP, HD, SD, etc. With built-in audi player, it plays ripped MP3 YouTube music directly. This YouTube downloader app has great downloading speed. Available for jailbroken devices only. Not suitable for novice users. How to Convert YouTube Video to WAV format for listening or adding up to music library? This article shows you the simple way to convert YouTube video to WAV so that you can play favorite music and add to your music collection for safekeeping. Feel on edge about extracting audios from YouTube videos for listening and adding up to playlists? Calm down, here is an easy YouTube extractor that can rip audio from YouTube to be saved in MP3, AAC, AC3, WAV, etc. 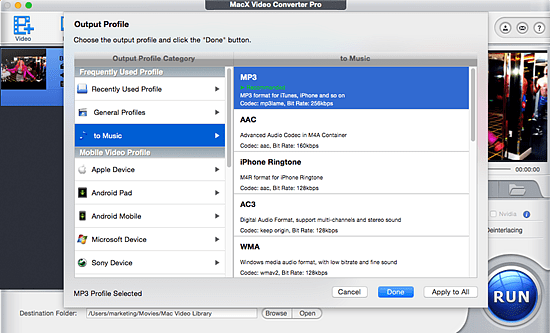 Wondering how to convert WMA to MP3 Mac? This guide shows you top 3 ways to effortlessly convert WMA files to MP3 on Mac (macOS Sierra/El Capitan included) for playback without any limits. MacX Video Converter Pro is the best YouTube MP3 converter, which can easily rip MP3 from YouTube video and convert YouTube to other formats such as MP4, AVI, WMV, MKV, AAC, AC3, etc for playing on various devices, players, TVs, PS4, etc, along with excellent YouTube video download feature.